Table Saw Safety – Save Your Fingers! February 17, 2009 By Editor & filed under Stationary Power Tools Safety, Woodworking Safety. Save Your Fingers! Why do table saws cause so many woodworking accidents? The saw blade does not care whether it is cutting wood, bone, or meat. If you use a table saw, then pay attention to these table saw safety tips! I met a person who previously worked in a Van Conversion Factory. He is medically retired at an early age. One day late afternoon, he made one last cut on the table saw. Now a thumb, index finger and middle finger are missing. Moreover, in his garage, he still uses his table saw without a blade guard or splitter. Does that make sense to you? Is this a wise use of table saw safety? Another man worked at a custom woodshop for thirty years. Just 6-months prior to closing the woodshop, he got careless and reached over the saw blade to retrieve a piece of wood. He lost two middle fingers. Carelessness – Don’t do it. Use Table Saw Safety wisely. A multi-toothed blade rotating at high-speed should incite a feeling of caution and respect. It should not instill fear. Table Saw Safety Guidelines. There is no magic procedure for table saw safety. Concentrate on what you are doing, and do not look around or talk while operating the saw. Be aware that many accidents happen after lunch, when you’re usually less alert. Do NOT use the table saw when tired. You invite trouble. When you plan your work, determine the simplest way to cut. Let common sense dictate – if something seems risky, it probably is. Do not rush (Woodworking Truth #1) Take your time, especially with table saw safety. Moreover, do not be a know-it-all. Overconfidence (“it won’t happen to me”) breeds taking dangerous risks. Table Saw Safety – Dress. Anything that flaps around is hazardous, such as long hair not tied back, necklaces, bracelets, ties and loose clothing. Do not work with your shirt pockets full of objects. Pencils and rulers have a way of dropping around the saw blade. Never wear sandals. Your feet need full protection in a pair of good walking shoes or sneakers. Do not wear bulky gloves; they can catch on things. 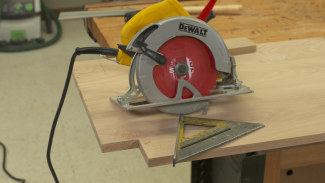 Table Saw Safety – Setup. You plug the saw into a grounded electrical outlet. Never operate your saw in wet areas. Make sure the electric cord is out of the way. You do not want to trip over it. 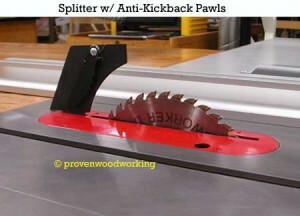 Use a quality table saw splitter with anti-kickback pawls. This prevents the wood from binding on the blade at the back end. Use a blade guard and check for smooth movement. Make sure the fence is parallel with the blade.The blade should be the same distance from your miter channel in the front and the back. Make sure it is. Then align your fence to the miter channel. Take a .015 feeler gauge and adjust the rear of the fence a feeler gauge distance away from the miter channel.Always unplug the saw, when you are changing blades or doing routine tune-ups. Make all adjustments with the blade at a dead stop. Set the blade no more than 1″ above the workpiece. Lock the Fence for ripping. 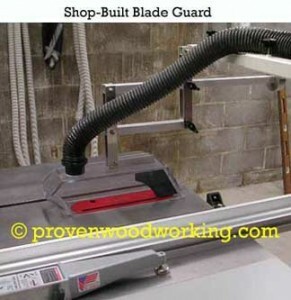 Table Saw Safety – Hands and Blade. Keep your hands away from the blade – use a Push Shoe. This reduces the chance of a serious accident. Know the tablesaw Danger Zone. Paint a Red Square around it. Do NOT reach over the blade, Period. It is a BAD Habit. Turn off the table saw and walk around to your outfeed table. Only retrieve stock after the blade comes to a complete stop. 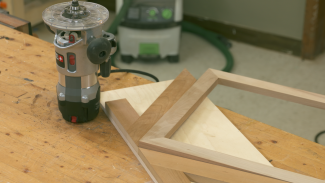 An Outfeed Table allows you to feed the work past the saw blade! Ripping causes more table-saw accidents, especially kickback. Again, a Push Shoe keeps your hands above the blade. Crosscut a split, knotty, or irregular end before using a push shoe for ripping. Use a quality saw blade, such as the Forrest Woodworker II. Table Saw Safety – Rip Fence/Miter Gauge. Never cut freehand! 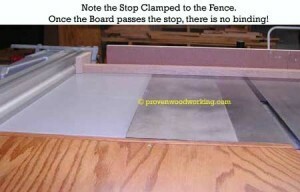 Use the rip fence to rip and the miter gauge to crosscut. Make sure that the miter gauge slides freely. 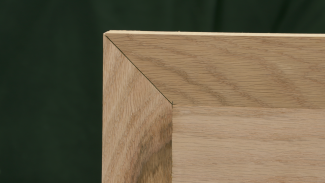 Never use the rip fence as a guide with the miter gauge. You are inviting kickback! Table Saw Safety – Cutting. Stand to the side of the cutting path. Do NOT stand in line with it. Normally, Kickback throws the wood straight back from the saw blade. Sharp saw blades are less likely to kick back. When you turn on the saw, let the saw blade reach full speed before each cut. Do not stop the work in mid-cut. That invites kickback. Push the work all the way past the blade – onto your outfeed table. Table Saw Safety – Cleanliness. Keep your saw table free of tools, scrap and extra wood. Normally, they find their way to the saw blade. 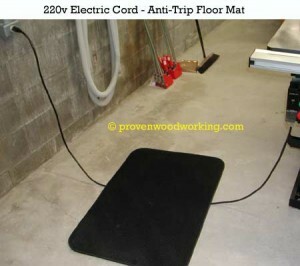 Keep the floor around your table saw free from sawdust and chips. Clean the saw blade with a brush, not your hands. Keep your saw blades clean. Resin-covered blades build up heat and make the stock more difficult to push. When you see resin build-up, unplug the electric cord, remove the blade, and scrub the blade with Simple Green (a degreaser) and a hard-bristle brush. It looks like new when finished. When you make sawdust, Be Safe! Would like to see safety video detailing left handed use of the table saw. At least some text explaining it. Hi Ron. Thank you for your feedback. I will forward your comments on to the proper department. Thanks for posting this. I always wear gloves (splinters, and I have small hands so gloves give me more grip strength.) I will remember to remove them while using the saw. Well said Walter, I bought one in March, a bit pricey compared to others, but you can’t put a price on lost fingers or a hand! Thank you I needed to read this. I have done some of those stupid things when working on my table saw.